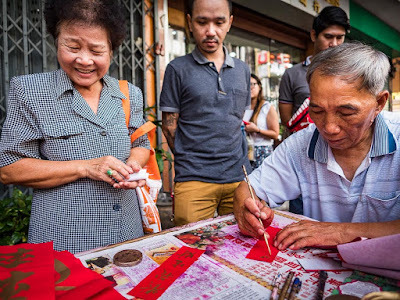 People watch a calligrapher draw Chinese New Year greetings for customers on Chareon Krung Road in Bangkok. Lunar New Year, also known as Chinese New Year or Tet (in Vietnam) is a huge cultural celebration in Chinese communities around the world. Thailand has a very large Chinese community and Lunar New Year is celebrated with gusto in Bangkok and Sino-Thai communities throughout the country. A calligrapher draws a greeting. Lunar New Year comes early this year. It will be celebrated on January 28 in Bangkok (it's usually in February). Lunar New Year provides a huge shot in the arm for the Thai economy. Restaurants are fully booked the weeks before and after the holiday period, Chinese opera troupes are fully booked and perform through out the country and people buy New Year supplies, like dresses and lanterns. One of the most traditional things to do is to go to a calligrapher and buy New Year's greeting. In Bangkok, the calligraphers line Chareon Krung Road in the heart of Chinatown. They set up on small tables and hand paint the greetings that customers buy. They use an oil based gold paint. Sometimes the put gold flecks on their work. 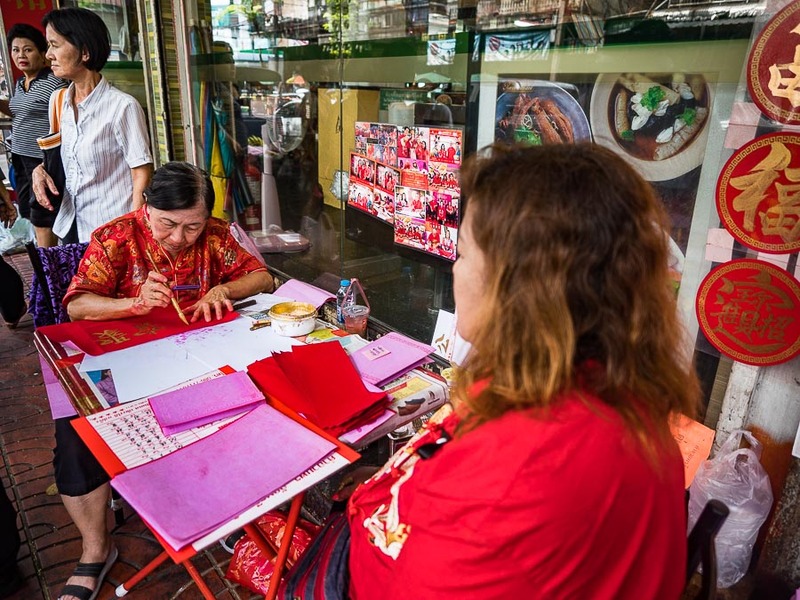 A woman calligrapher (the only woman calligrapher I've seen on Chareon Krung) finishes a greeting for a customer. A detail photo of a calligrapher at work. I don't know what the calligraphers charge for their work or how much they make during the New Year season. They are busy though. When they're not working on customized calligraphy for customers, they're drawing spec pieces that they hang near the stand. Passersby, in too much of a hurry to wait for a customized piece, buy the spec pieces. 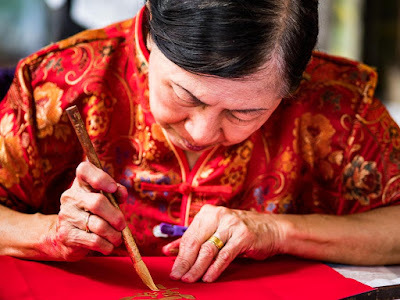 The woman calligrapher works on a piece. This is my fifth Lunar New Year in Thailand. 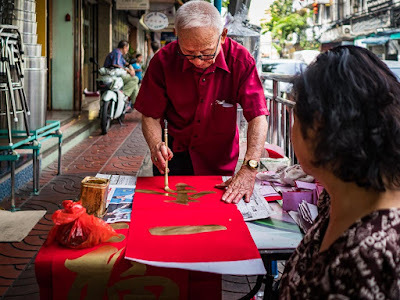 I photograph the calligraphers of Chareon Krung at least once a year. Chinese New Year is a loud, crowded, incredibly fun holiday. 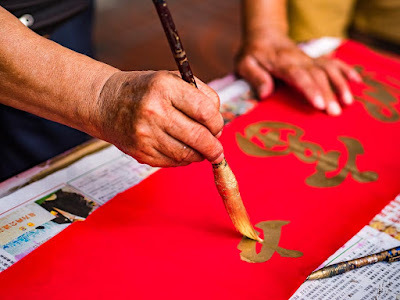 Photographing the calligraphers is sort of how I mark the beginning of the Lunar New Year period. I'll be spending a lot of time in Bangkok's Chinatown over the next couple of weeks. There are more photos of the calligraphers in my archive.